Why Choose F.J. Moore Plumbing Vent Flanges? We are a third generation family owned business started in 1908. One hundred years of building a solid reputation for delivering the highest quality products, on time, for a very competitive price. 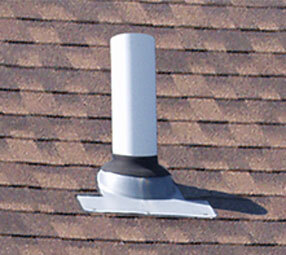 Our vents cost more, until our customers consider the time savings in easy installation, years of guaranteed reliability and the tiny difference in total cost of a new or replacement roofing system. Models to fit all applications. …leave the white plastic plumbing pipe exposed to look cheesy in the sun. You can paint it, if you can find any that sticks. The part that protects against water penetration is rubber, which deteriorates over time from the sun and roof surface flexing. Replacing one requires removing shingles, applying roofing tar sealant, and they don’t come with a written guarantee. The Plastic Top Bonds With The Plastic Pipe To End Expansion And Contraction Problems. Constructed to withstand winter’s bitter cold and the blistering roof top heat of summer. A permenant solvent weld, made with a PVC adhesive, locks the Olson Vent Top to the PVC pipe. This allows the roof to rise and recede, with the temperature extremes, without compromsing the seal at the pipe. Ice will not stick to the PVC ( Poly Vinyl Chloride ) top surface. The solvent weld is made with PVC or PVC – ABS combination solvents for plastic pipes. Teddy Roosevelt was President in 1908 when Francis J. Moore borrowed $100 from his father to start his own business. 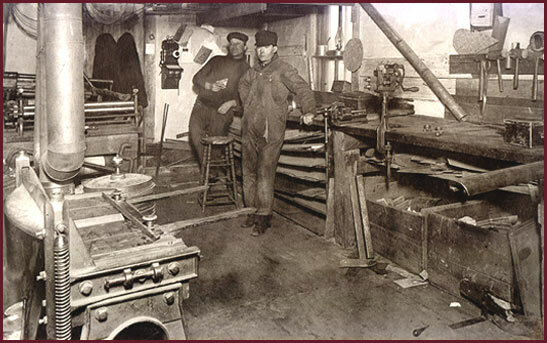 F. J. bought a mule, cart and the tools he needed to fabricate sheet metal products by hand, one at a time. After ten years of working and experimenting he’d perfected a unique two part plumbing vent flange for roofs, the patent for which was issued on September 18, 1918. The design remains unchanged to this day. Frank Moore loved to improve the design of the tools and products he used. Over a fifty year span he was issued sixty more patents for products as diverse as locks, farm gates, brakes and toilet roll dispensers. Now in the third generation celebrating one hundred years as a family owned business, we appreciate the dedicated employees, distributors, dealers and loyal customers who made it possible. Great Grandpa Frank was focused on manufacturing the very best products: roof plumbing vent pipe flanges and flashing of the highest quality, superior design, long lasting functional reliability at a fair price. His design has not been improved upon, and neither has his focus as our company philosophy going forward.